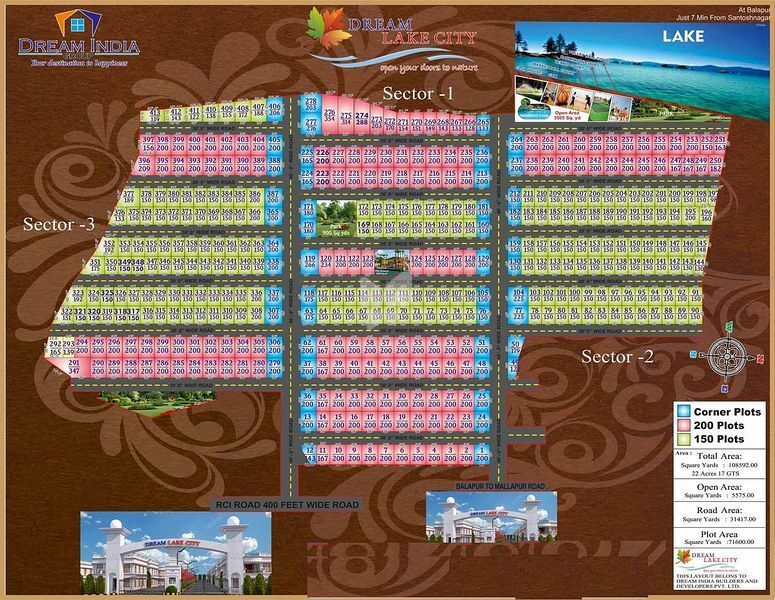 How Far is Dream India Dream Lake City Plots? Remarkable real estate experience and some of the finest gated communities define Dream India Group. In continuance of our commitment to quality and family life, Dream India Group brings another Iconic venture " Dream Lake City". It has been a long time vision of ours to build a community by the lake with beautiful view where nature and family life is enjoyed and cherised. Adjacent to a fully developed residential area, our new project is an opportunity for the families to live close to nature and lake. With an idea and vision to develop lake side beach, boating and many other amenities such as childrens park, park, gym, basket ball and more, the Dream Lake City shall soon become the most attractive gated community of Balapur. Along with nature and quality of life, Dream Lake City is fully loaded with various budget and space options that you will always have high priority on mind. Designed with finest taste of architecture and exteriros that will inspire awe and envy, Dream Lak City is a long cherished dream of owning an ultra-modern house at an affordable price.